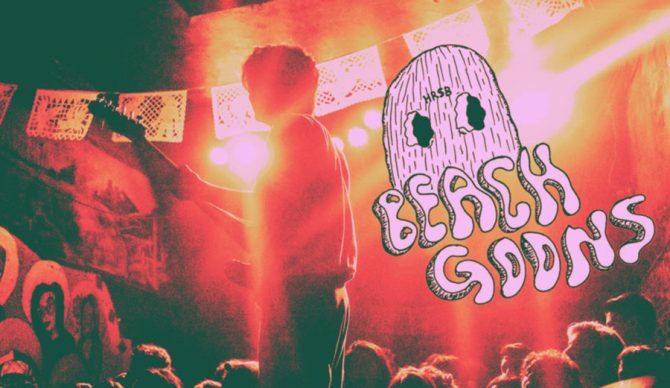 In just a few short years, San Diego’s Beach Goons (comprised of founding frontman Pablo Cervantez, bassist David Orozco, and drummer Chris Moran) have gone from playing local libraries to entering the national buzz band conversation, courtesy of their unique merger of punk, surf, and cumbia music. On their new album, hoodratscumbags (released via GRNDVW), the band conjures an early Strokes-meets-Arctic Monkeys sound that equally captures vintage reverb, distorted guitars and an insane amount of energy. Pablo, you’re 19 years old, so that must mean you started this band when you were an infant. Tell me about your musical upbringing. Pablo (guitar, vocals): (laughs) I picked up the guitar because my dad had a guitar laying around growing up. I saw it one time, grabbed it, and it felt fun to play. After that – I must have been nine or 10-years old – I begged my mom to buy me a guitar and she finally did. I had an older sister who was really into Depeche Mode and The Cure and a bunch of 80’s New Wave. I got really into that, which pushed me to do something with music. That’s how it all started. Is it true hoodratscumbags took you guys two years to write? Why so long? Pablo: Yeah, that’s true. We were really focused on the songs and how they came out. It was all about getting the songs to how we wanted them and working on the record as hard as we could to pump out the best thing possible. David (bass): We were also shopping the record around and waiting for the right label that we wanted to work with to put it out. GRNDVW is the label that ultimately put out the album. How did you link up with those guys? Pablo: They actually emailed us randomly and asked if they could come to a show and if we could get them on a guest list, which we did. After that, they invited us to their offices and that was that. You all will be playing Riot Fest in Chicago in a few weeks. How excited are you for that? Pablo: We’re super stoked. We’ve never even been to Chicago. That show came through our booking agent and the label. We had nothing to do with it. They offered it to us and we were stoked to go. If each of you could pick a band at Riot Fest to join you on stage for a song, who would it be? David: Madonna…. (pauses for a few seconds). What am I talking about? I mean, Blondie. Chris (drums): Definitely Blink-182. I don’t know about the current version of Blink-182, but maybe 2001 Blink-182. Pablo: GWAR. And I’d love to get Gary Numan on stage with us. What about the reverse? What band sets would you like to crash? Chris: I would do Sum 41. Are they playing? Pablo, you’ve been the sole constant member of the band. What have been the biggest challenges in finding a constant drummer and bassist? Would you ever add a fourth member? Pablo: The difficult part about it has to do with writing the music. When I didn’t have members it was me just doing everything in my room by myself. It helped me shape the style and the sound I wanted but adding Chris and David definitely helped a little more and kind of took the stress away. We would definitely add another member and it would probably be a second guitarist just to fill out the sound. I read that some of your musical influences include Sly and the Family Stone, Chicano Batman and Descendents. When it comes to your instruments, who would each of you consider your biggest musical influence? Pablo: I would say James Jamerson on bass from the Motown record family. That was very inspirational on bass to me. Chris: As far as drummers, I don’t know. I definitely grew up on “dad rock” music. My dad was super into classic rock and I was really into The Who and the Stones and stuff like that. So I’d probably say Keith Moon. Not to say I listen to The Who a bunch now, but he was definitely who I tried to emulate when I first started learning drums. I wanted to be him. David: Yeah, it would be Karl Alvarez [from Descendents]. Any bass player that plays really fast and does insane fills is just sick…And [Alvarez] plays with his fingers! It’s insane. Your song “Without U” has 4.5 million plays on Spotify. By any niche-genre standard, that’s a lot. Do you ever stop to think about that? Pablo: That really puts it in perspective, but I don’t really focus on that kind of stuff. I’ve seen that number a couple of times and I’ll be shocked and amazed and grateful, but most of the time I’m not really focused on it. When I am, it’s just insane to even comprehend. David: It blows my mind. It’s crazy because some of the artists that I like…it’s just funny to compare the streams and followers. You all are in a growth phase where you’re going from local favorite to regional buzz band. What was the turning point for you in realizing you were starting to get attention? Chris: We all agree that there is a big difference between a local band and a national touring band. We’re about to get our first taste of touring nationally in a few weeks. We’re just really stoked. The shows are getting bigger and bigger and people are just responding super well. Bigger bands come up and are super nice to us. It’s awesome. We’re grateful for everything. Pablo: I feel that it built up over time, but there was also a turning point at the beginning of 2017. That’s when we stopped playing house shows and just stuck to venues and we really felt a big difference when that happened. Chris: We started getting paid then, too (laughs). Speaking of house shows, you played regularly throughout San Diego for a long time. What are your top San Diego neighborhoods for house shows? Pablo: I used to love playing down here in Logan. There is a spot called The Stronghold and I used to throw shows there. That’s one of my favorite spots. Probably San Isidro too. David: When I was 13 years old, Lemon Grove was poppin’. It was crazy. There were punk shows there all the time. These days, I don’t know. Maybe North Park? Chris: They get pretty wild all over. It’s hard to say. You guys have solid Mexican roots. How do you decide which songs you’re going to sing in Spanish and which ones to do in English? Pablo: We don’t. It kind of just happens. If I feel like the song needs to be sung in Spanish, I’ll sing it in Spanish. If I feel it needs to be sung in English, I’ll sing it in English. You’ve recently stated a desire to distance yourself from the “surf music” genre despite your known affiliation with it. Can you speak to that? Pablo: We try to stay away from that label. Tying down surf music to the whole beach image is just too played out. Chris: It’s been done to death, especially in San Diego. There are bands that are still doing it but to us, it just feels like it’s time for something new. We want to distance ourselves from that title as much as we can. Pablo: I went into the band kind of wanting that association, but because of other bands coming up at the time, it became kind of about fitting the sound just to be able to play shows with them. Over time, we’ve naturally grown out of it. Check out hoodratscumbags and watch Beach Goons play Riot Fest in Chicago’s energetic and fun Douglas Park, September 14-16, 2018. Tickets are on sale now.